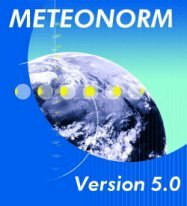 METEONORM 5.0 (Edition 2003) is based on over 18 years of experience in the development of meteorological databases for energy applications. It is a comprehensive meteorological reference, incorporating a catalogue of meteorological data and calculation procedures for solar applications and system design at any desired location in the world. METEONORM addresses engineers, architects, teachers, planners and anyone interested in solar energy and climatology.